Having beautiful tile floors can be one of the most impressive features in your building and can make or break a first impression. One of the biggest challenges with tile floors is keeping the grout clean. Porous grout lines trap dirt over time, causing your tile to look dull and sullied in appearance. When these floors are correctly and regularly maintained, they will not only create good impressions on your employees and guests, they will also help enhance your professional image as well as prove a clean and safe work environment. You can count on ServiceMaster Cleaning & Restoration Services to keep your tile floors looking their best. We will work with you to create a custom cleaning plan to care for your individual needs. 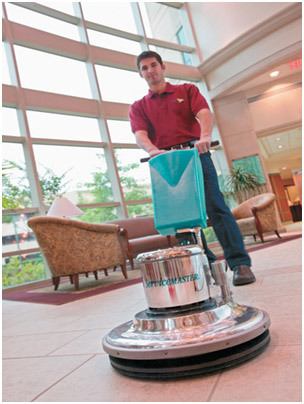 We use the best floor care products and the most innovative methods and equipment for optimal effectiveness. We use a high pressure hot water rinse with an enclosed vacuum system. Our grout cleaning technicians can also apply a grout sealer after the clean. This extra layer of protection seals the grout, making it resistant to spills and stains, keeping the grout looking clean longer. Spots and stains are pre-sprayed using our proprietary green cleaning products. Grout lines are sealed to preserve cleanliness and prevent long term damage (optional). To help your business tile floors shine, call ServiceMaster Cleaning & Restoration Services at 1 (800) 377-7166.